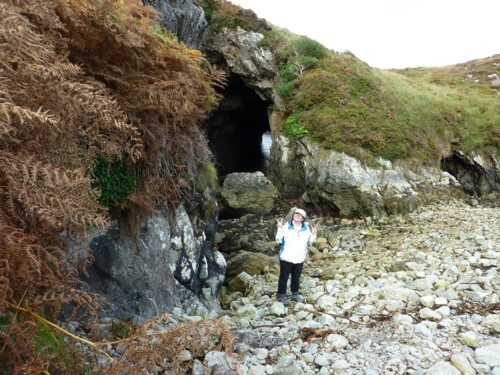 A superb walk with stunning coastal views combined with views over old disused copper mines, shafts etc. The walk won’t take you more than 3 hours so you will have plenty of time for either another walk or a car tour. 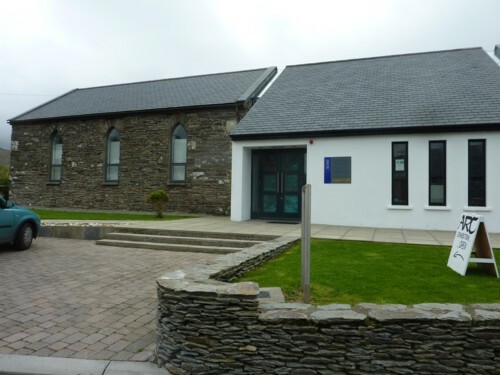 We parked at the Allihies Copper Mine Museum (a former Methodist Church), had some refreshments in the cafe at the museum and followed the looped walk. We spent time in the copper mine museum at the end of our walk – The museum is very well laid out and is well worth the few euros to get in particularly having seen some of the derelict mines on the walk. Pick up a leaflet for the mine trail at the museum. Ordnance Survey map 84 also has the map outlined. Otherwise download the mining trail from the museum’s website. The trail leads down to the beach. The sand itself was created during the copper mining days so be sure to read about this when you visit the museum. 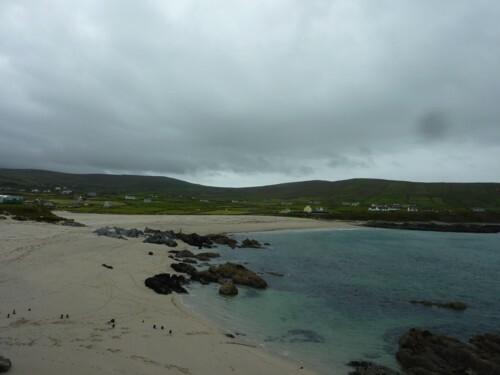 From the beach we headed north along the coast past Allihies Point and Gariflan point before joning up with the R575 for a few metres heading back in the direction of Allihies but then veering off to the left up towards the disused mines. The trail is well marked. 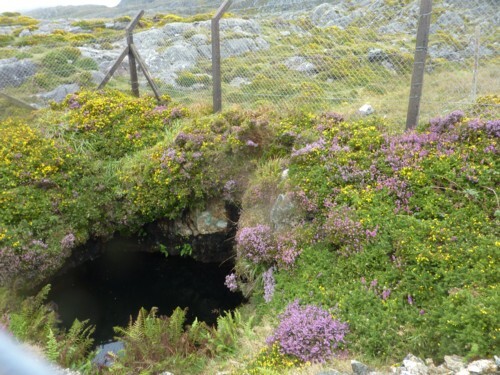 The strenuous bit is once you turn off the R575 and climb up to the disused mines. However, the stunning view compensates for the climb. 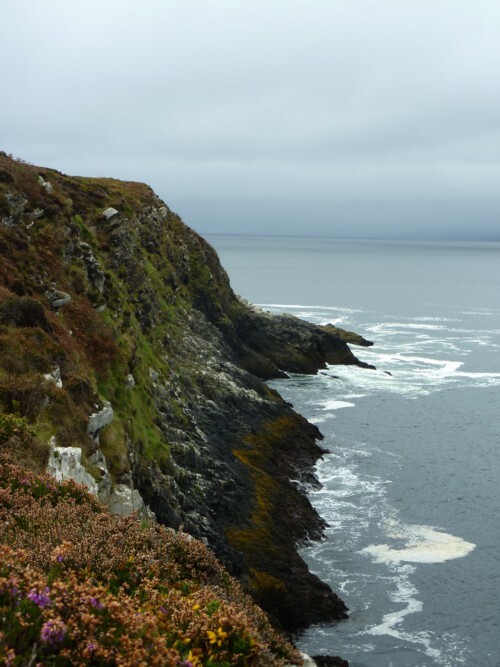 Beara Peninsula looped walk – The Pulleen loop – 1.5 hours and easy! 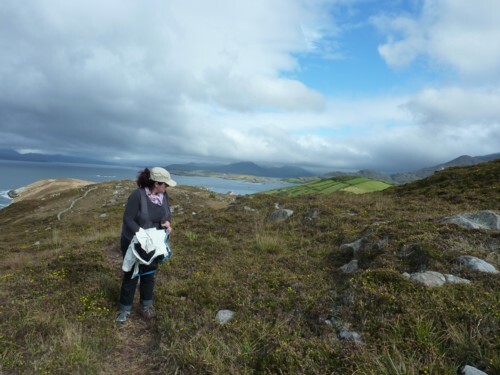 We spent ages planning a few short easy-going yet scenic looped walks on the Beara peninsula as the Beara way itself is not looped, ie you need to be dropped at one end of a day’s walk and picked up at the other. The looped walks enable you to leave the car and return to the same spot. Our first adventure was along the Pulleen Way loop. The rendez-vous point was at Ardgroom where there is a cafe, shop, post office and petrol station all combined. After quick refreshments we headed to Bird Point (Ordnance Survey Map 84) which is about 5km from Ardgroom on the north coast of the Beara Peninsula. Parking is in the small harbour next to the derelict lorry at Bird Point. 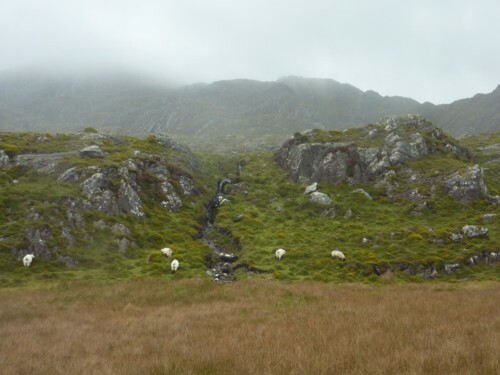 The grade is easy, the track is well signposted and the walk takes about 1.5 hours. We actually followed the coast up to Dogs Point and retraced our steps back to Bird Point as the view over the ocean is so amazing. The Coosemore Caves remind me of the very well known Hole in the Rock near Paihia on the Bay of Islands in New Zealand! Doneraile Court was cared for and preserved by the Irish Georgian Society until it was handed over to the OPW some years ago. Sadly since that hand-over, the house has been boarded up and has been in an unloved state. It is disheartening for Irish Georgian Society members who subscribed so generously over the years towards the restoration to see it slowly fall back into decay. The house is steeped in history having been the home of the St Leger family for many generations. It’s time to encourage Failte Ireland, the OPW and Cork County Council to work together to create a wonderful tourist attraction. The Examiner reported today some encouraging news that plans are afoot to spend euro 10 million to open up the house. We should not forget our domestic tourists in the equation when working out the viability of this project. The park is currently very well used and is a fabulous amenity for all to enjoy. Lets make it even more special by opening up the house. The celtic tiger has definitely forced us into complacency about what we eat! Having spent the few days before my train trip savouring the delightful fresh crispy pain au chocolat at The Yew Tree Bakery in Oughterard, Co Galway, my breakfast on the Cork to Dublin train was a real let down. For starters, forget being able to buy a cup of herb tea (Take note Irish Rail – Herb Tea Bags last a very long time and are not heavy to transport!). All I got when I asked for this was a vacant stare from a seriously unenthusiastic chap who spoke very poor English (Should I have told him that there are probably 100s in this country who would be more than happy for his job right now!). So I settled for watery hot chocolate (or rather, as it said on the cup – a hot chocolate flavoured drink). Avoid this, it’s terrible! For euro 5.25 I bought the hot chocolate and a fruit danish in so much plastic that it felt like I was unwrapping a christmas present and destroying the planet in the process. The list of additives on the packaging was beyond belief and I seriously wondered if I would survive the day. I have just had a browse through the West Cork Enterprise Boards 2006 annual review to see what its objectives are. It aims to increase the number of viable jobs through the region, ie it supports rural development and local entrepreneurship. In 2006 the board provided financial assistance totalling euro 260,000 including 8 employment grants, 6 capital aid projects and 3 feasibility studies. Financial assistance was approved in support of 3 childcare facilities, 4 food processing projects, 6 other manufacturing and local service projects and 3 feasibility study projects. The majority of financial assistance went to manufacturing projects (10 in total) with particular emphasis on the development of food and craft sectors. 12 of the 17 projects were new start ups and the majority of businesses were located in the Skibbereen, Clonakilty and Beara areas. The Bandon Community Spring Clean has already begun so it’s time to get involved. Residents from the Gaggin area of Bandon filled over 20 large black bags with refuse dumped along the road just yards from the Recyling Centre (much of it recyclable). Participants from the Rosmini Centre in Bandon did a fabulous job cleaning up the Railway Walk that runs from near Innishannon to Bandon. Fas cleaned up part of the town park and members of Sinn Fein collected over 30 bags from the riverwalk below Supervalu. We still need to remove approximately 25 Supervalu trollies from the river and hope that Supervalu will give us some assistance in this process. 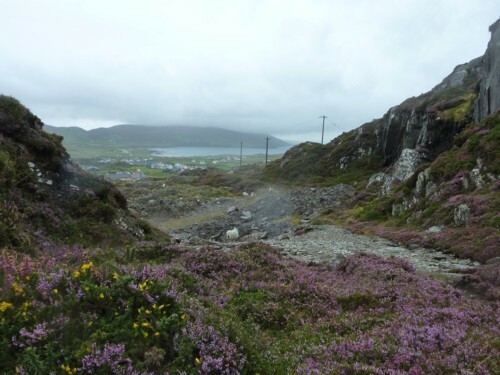 A mountain of waste was removed from Blue Hill which runs parallel to the Clonakilty Road between Gaggin to the Recycling Centre. An entire skip was not enough to accommodate all that was collected in this area. Help us save our countryside and do your bit for Bandon Spring Clean. Tomorrow, Saturday, 26th April there will be a concerted effort to clean up Castle Road leading out to the golf course. The clean up starts at Hartes Car Park in Bandon at 10am but join us anytime along Castle Road on the way to Bandon Golf Club. We need as much help as we can get. This road out beyond the 60km limit is sparcely populated so we need people from further afield to help us! Today was the schools turn to get involved in the spring clean. Sadly the weather played havoc with the schedule and some of the schools have deferred their clean up until next week. You are currently browsing the archives for the cork category.